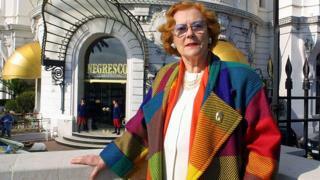 One of France's most flamboyant hoteliers, Jeanne Augier, has died aged 95, bringing to a close an era of glitz and glamour on the French Riviera. Augier ran the pink-domed Negresco hotel on the Promenade des Anglais in Nice for more than 60 years after inheriting it from her father in 1957. There, she welcomed guests including the Beatles and the Sultan of Brunei. Augier devoted her life to the hotel on the seafront, whose flags were at half-mast following news of her death. Her success in building the hotel up into a favourite among celebrities saw it develop a client list with names such as Salvador Dali and Elton John, who featured the hotel in the video for his hit song "I'm Still Standing". Augier, instantly recognisable by her auburn hair and bright red lipstick, once famously told Microsoft founder Bill Gates that he was not rich enough to buy her hotel. In an interview with French newspaper Liberation in 2009, she said: "I must have a hundred offers a year to buy the Negresco. It's out of the question." The hotel, with its chandelier-lit dining room and sweeping views of the Mediterranean, describes itself on its website as "a place where everything is possible... flamboyance served on a tray". It is named after its Romanian-born founder, Henri Negresco, and has more than 100 rooms, each with their own unique furnishings and French art "collection pieces". The hotel opened in 1913 and quickly became popular with European royalty. In 2016, the Negresco hotel was used as a field hospital following the Bastille Day lorry attack that killed 84 people in the city.